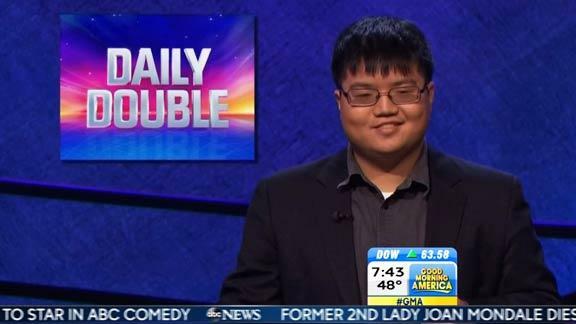 Fans of “Jeopardy” won’t soon forget the name Arthur Chu. Chu, 30, stunned fans of the long-running game show last week, as he barreled his way past eight competitors to win the game four nights in a row. But it wasn’t his impressive winning streak that turned him into an Internet sensation — it was how he won. Taking a cue from past “Jeopardy” champions, Chuck Forrest and Keith Williams, who bounced around the board in order to confuse other contestants, Chu decided to toss tradition out the window. Typically, players play 'top to bottom' — selecting a clue with the lowest dollar value and work their way down to higher-valued clues on the bottom of the game board. It’s not a rule, but the game has been played that way for so long that viewers and players alike are accustomed to that progression path. Chu stubbornly targeted the $1,000 clues first, snatching them away from his competitors and jumping around the board to maximize his chances of stumbling on the coveted Daily Double, which are usually hidden among the higher-value clues. He was so intent on winning that he hit the buzzer sometimes before host Alex Trebek could even finish reading the clue. As if he hadn't shaken things up enough already, Chu even bowled over Trebek at times throughout the show. After unlocking a Daily Double for Sports, Chu blurted out a bet for just $5, knowing he wasn't likely to get it right. And before Trebek could finish reading the clue, Chu spoke over the host, saying he didn't know the answer. Chu seemed a bit dazed by the backlash but had no problem defending his strategy — he’s taken home $102,800 so far and stands to add even more to his loot when his next show airs on Feb. 24. He credits Forrest and Williams for inspiring him, but it turns out his decision to rebuke tradition had more to do with timing than anything else. Chu, a history buff from Broadview Heights, Ohio, had auditioned for “Jeopardy” two years ago and thought his hopes of earning a spot on the show were all but lost until a producer called him out of the blue in November and told him he would be on the show at the end of the month. That left him just 30 days to cram. Chu, who works for an insurance company and freelances as a voice-over actor, knew he was weak in sports knowledge. In defense of his controversial $5 bet, Chu says he didn't bother to give an answer because he knew he’d never guess right. Fans called him out for being a bad sport, but Chu says it was all about playing to his strengths. As for offending die-hard “Jeopardy” fans, Chu seemed more concerned with Trebek’s reaction than anyone else. Even the host couldn’t hide his irritation when Chu rattled off answers while he was still speaking. Fans will see if Chu gets the last laugh when his fifth game, which has already been taped, airs on Feb. 24. With a fifth win, Chu would be guaranteed a spot on the show’s special “champions” episode, where long-running winners go head to head. In the end, he’ll endure a little more public ridicule if it means taking home an even bigger prize. With the winnings, he says he plans on visiting family in China, saving a chunk and donating the rest to a charity benefiting fibromyalgia patients.